Founded in 1897 on the initiative of Federico Eusebio, the Museum was created exclusively as historical and archaeological collection. In 1976 it was moved to its present location and enhanced with the addition of the section of the natural sciences. The Museum is constantly being integrated with the finds from archaeological excavations and research on natural territory. The exposure of pottery and lithic artifacts provides a comprehensive overview of the Neolithic settlement of Alba (end of VII – beginning of the fourth millennium BC). Among them, stand out the tips of green polished stone axes. 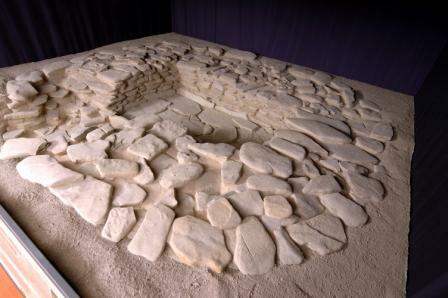 Particularly interesting is the life-size reconstruction of a Neolithic hut, which was found the hearth, situated in borgo Moretta. The Copper Age-earlyBronze Age(second halfIV- end ofthe third millennium BC) belongs to themonumentalcollectivetombandsomegrave goods.Amongthemstandsacopper knifewithtracesofleather scabbard. The characteristic features of the Bronze Age (second millennium BC) emerge from the cemetery where they were found urns, vases, ornaments and items of personal clothing. In this context interesting is the inhumation burial of an individual with a grave goods consists of pin bronze and from a bowl. The chronological framework is completed with exposure of the pottery from settlements and a bronze sword deposited in the river Tanaro. The Iron Age (V-II century BC) is documented by pottery and metal finds, referring to Ligurian groups employed in subsistence activities and the mercenary. some Punic and Sardinian-Punic coins constitute a trace. The visit begins with the votive stone of Caius Cornelius Germano and continues with the findings related to Alba Pompeia, Roman municipium from 89 BC. The numerous excavations, carried out by the end of the nineteenth century to today, allow us to reconstruct the original appearance of the city in the early centuries of the imperial age. 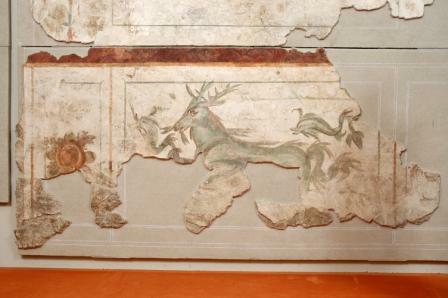 Proof of this are the findings related public building, including the floors in opus sectile, elements of architectural decoration in marble and the reconstructions of rooms belonging to some private domus. The material culture, standards of living and business activities of the ancient inhabitants of Alba are documented by the presence of pottery and glass and bronze artifacts. Large space has dedicated to the necropolis whose tombs are visible in the exposition of rich grave goods, consisting of pottery and objects of everyday use like the inkwell, the strigil the box for cosmetics and a bone fan. The custom of placing a coin in the set has allowed us to collect important numismatic collection. 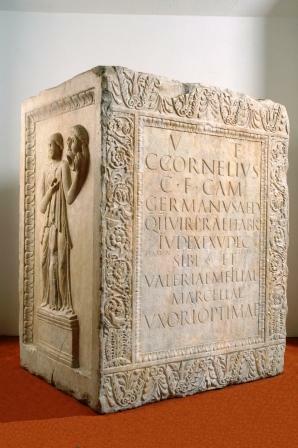 The course concludes with a fascinating gallery of funerary inscriptions, one of the richest collections of Piedmont, among which there are the stele of Gaius Cesium and the one with the two male portraits. The fossil imprint of a large palm leaf introduces the visitor to the halls of Natural Sciences. In the first hall, dedicated to Geology, shows the geomorphological structure of the Langhe and Roero. The showcases exhibit some of the richest collections of fossils collected in the various geological formations outcropping in Alba region, those Oligocene until the beginning of the Quaternary, when the accumulated sediment finally emerged on the seabed of the Gulf Padano between 34 and 2 million years ago. Stand out the fossilized remains of a whale due to higher Tortoriano (about 8 million years ago) and a proboscidean dating from the late Messinian (about 5.5 million years ago). In the center of the hall, there is a large collection of minerals from the Cuneo Alps. 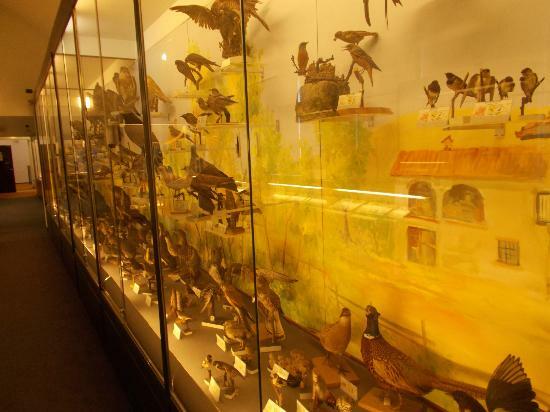 The second room is dedicated to zoology and it begins with an illustration of animal evolution. Some showcases illustrate invertebrates, one with fish, amphibians and reptiles, and another with mammals and birds, where the painted backdrop allows to imagine the natural habitat. The hall of Botany begins with the evolution of the plant kingdom. It illustrates the tall trees, mushrooms, the truffle and some ecological aspects of vital importance to humans. At the centre there is a teaching showcase on the morphology of the plants, while a video illustrating all the species of Alba strongly protected. 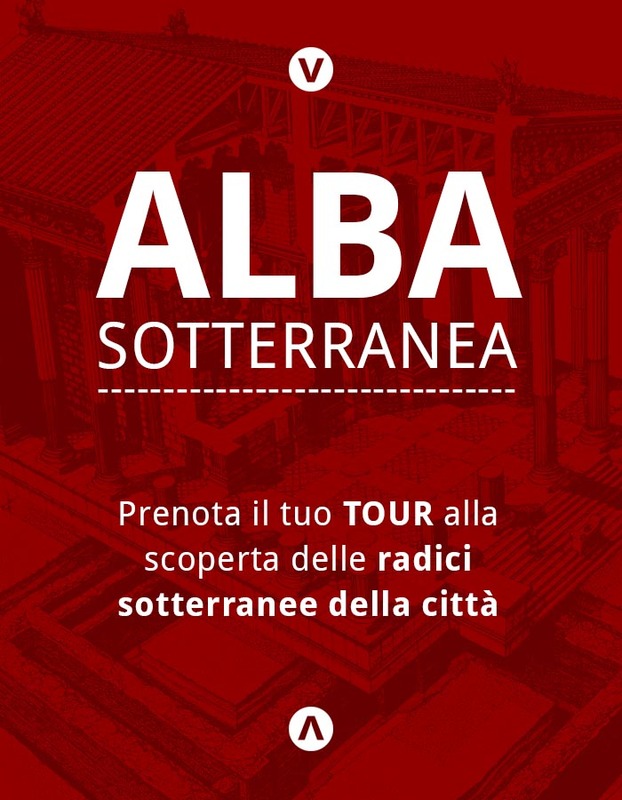 The municipality of Alba, in collaboration with the Superintendence for Archaeological Heritage of Piedmont and MAE, has provided enhance an archaeological tour consists of 28 sites at which preserves important remains of Roman structures attributable to the city of Alba Pompeia and the following settlement of the Middle Ages. Each archaeological site is indicated by an explanatory panel and the various sites are part of an organized tour that may only be partially autonomously with the help of an educational booklet or in full by guided tours. P11 The booming of the Neolithic economy. P10 From the forests to the fields. The development of the Neolithic economy. EP2. BLACK BOARD 2, THEATRE ROOM. INSCRIPTIONS.